TFM Tool v1.0.8 is a small application for windows computer which comes with multiple functions to repair and manage your device. It allows you to remove Screen Lock from your Samsung Smarphones without losing your personal data. 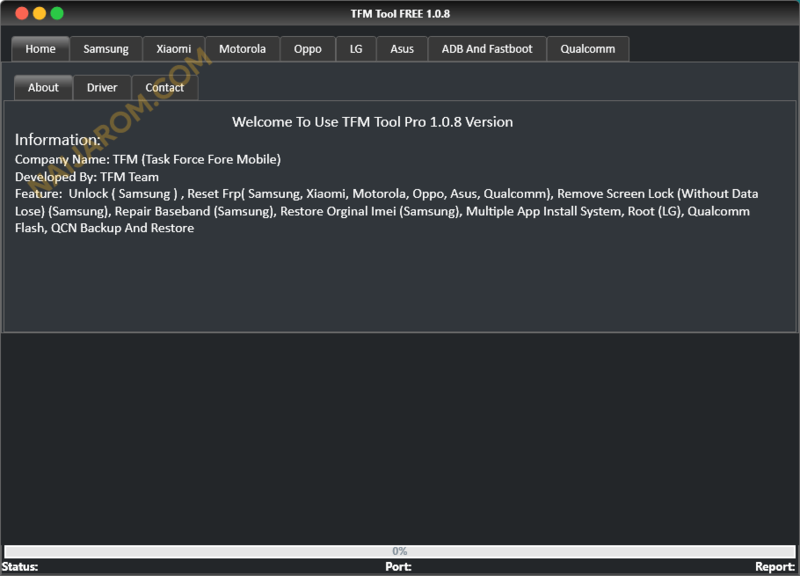 The various features of TFM Tool v1.0.8 includes Unlock (Samsung), Reset FRP (Samsung, Xiaomi, Motorola and Oppo), Restore Original IMEI (Samsung), Root (LG), QCN Backup and Restore. TFM Tool v1.0.8 allows you to repair baseband of your Samsung Smartphones. It also allows you to activate Multiple App Install System. Apart from this, One of the main feature of TFM Tool v1.0.8 is that it also allows you to quickly flash your qualcomm device with its simple and easy to use user interface. Since, TFM Tool v1.0.8 is an open source tool. You may use it free for always. [*] Credits: TFM Tool is created and distributed by TFM Team (developer). So, full credits goes to TFM Team (developer) for sharing the tool for free.